Copper has played a very important part in the history of modern man – and right here in America. Copper recycling became a widely used technique as soon as it was discovered that it could be melted down and reused to make new products. We have literally been recycling copper and copper alloys for hundreds of years. One of the most well-documented uses of recycled copper was during wartime. Many of the weapons used in American wars were made out of copper household goods, such as pots and pans, that were collected and melted down to support the war effort. Historical evidence reveals that all of the copper products that were made prior to the Revolutionary War were made of recycled copper. British rule mandated that all copper ore discovered in America be sent to England for processing. After the war, Early Americans continued to recycle copper to make new products. Today, recycled copper still accounts for nearly half of the copper that is produced and sold in the United States. Modern technology has changed the process of recycling unalloyed copper scrap material into new copper products. 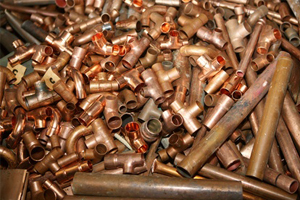 Brokers and processors sell copper scrap through a national network to manufacturers. Copper scrap that is received by recycling plants is inspected, graded and analyzed by hand, machine or sometimes through a chemical process. Any loose scrap that is recovered will be baled and put in storage until it is needed. This type of scrap must be kept clean, identified and segregated according to the alloying elements and purity/impurity levels. Scrap that has an “unknown” composition can still be melted down and then analyzed to determine what it is made of. Alloys are melted together by composition along with virgin materials to create a product that contains a specific alloy composition. Clean un-alloyed, un-coated copper solids, punchings, clippings, bus bars, pipe, tubing and commutator segments. Melted directly and sometimes fire-refined to bring to a “higher purity level,” which can be checked chemically when the material is in the molten stage. The molten copper is then de-oxidized and then cast into intermediate shapes for further processing. The same as No. 1 copper scrap, but can include pieces that are oxidized, plated or coated, such as oxidized copper wire or coated copper wire that is free of oxidation. Electrolytically refined to create a product at a specific purity level after fire-refining and melting the copper to cast it into anodes for cathode production. What does “electrolytically refined” mean? The process used for this type of refinery requires the cast anodes to be dissolved into a bath of sulfuric acid before being electroplated out of the solution onto a stainless steel sheet. Copper sheets are then pulled off of the stainless steel sheets before they are placed between anode plates in other electrolytic cells. An additional electroplating process is used to transform these anodes into copper that is 99.98% pure. This refined copper is then built up into what are known as cathodes, which are then plated out onto the pure copper starter sheets. According a 1996 study, approximately 65% of all the copper and copper alloy scrap in the United States is remelted directly by foundries, ingot producers, wire rod producers and brass mills. The other 35%, which was approximately 599 tons at that time, goes right back into manufacturing through smelting and refining. Over a million tons of copper scrap was directly remelted in the United States in 1996. 70% of it was recycled by brass mills, 22% was recycled into ingot cast copper alloy products and 8% was reused by other industries. In the past 30 years, copper scrap consumption has grown by over 50%, with brass mills accounting for nearly all of the additional growth. The United States has been able to remain very self-sufficient in its consumption of copper, due in large part to its recycling of copper and copper alloy scrap. The value of copper scrap remains high, with No. 1 copper scrap coming in at over 90% of the market price for new refined copper. An estimated 700 billion pounds of copper has been mined to date, with most of it still being used by consumers today. Many industries rely heavily on copper and copper alloy recycling.